What does this mean? Well, Eclipse does a lot behind the scenes with source files. And this includes Eclipse Indexer, Outline View or Syntax Coloring. The drawback of all these great features is: it does not make the Eclipse framework faster. The Eclipse IDE with its Java foundation is in my view the best IDE in the world, but unfortunately not the fastest. That’s why the Eclipse community has implemented settings to keep things within boundaries, and the above dialog is one of this. 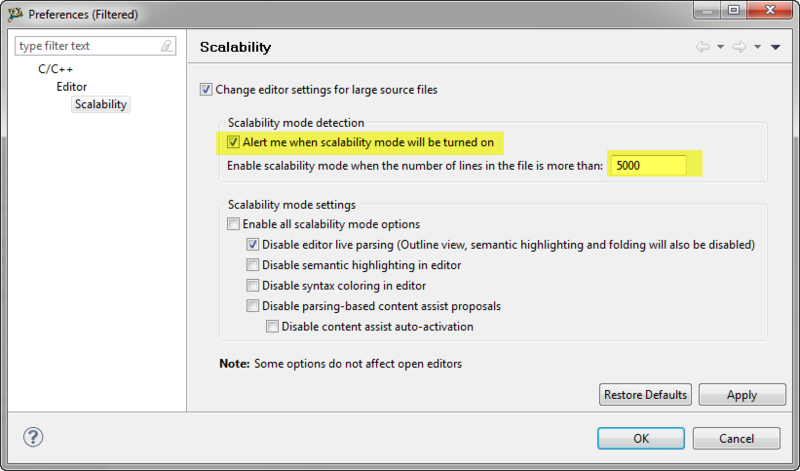 The same settings are available with the menu Window > Preferences > C/C++ > Editor > Scalability too. I can configure if I do want that dialog (I usually switch it off), this is the same setting as the check-box on the first dialog. I can change the line number settings to warn me about really big files only. The warning dialog typically shows up if I open one of the header files containing all the peripheral register declarations, or during debugging if I step into library code. This turns off features which might slow down Eclipse. And there is a price for performance: less functionality.